The heart, a muscular organ that is the center of the circulatory system, has the role of pumping blood to the whole body through the web of blood vessels. Blood is responsible for carrying the oxygen and other substances that our body needs to maintain its normal function, as well as for the waste removal. There are around 5 liters of blood inside of an adult with average size. The heart is the only muscle that works constantly and only stops after we die. For every second that passes, 15 million blood cells die. 200 billions of platelets, the disk-shaped fragments of blood cells, are produced on a daily basis. While an adult normally has 5-6 liters of blood, an infant only has 1 liter. Aorta, the largest artery of the body, supplies all the body parts with blood with the exception of lungs and the heart. Oxygenated blood is carried only by the pulmonary vein, while the rest of the body's veins carry deoxygenated blood. Our blood naturally has no color, and the bright red color is due to the pigment hemoglobin which is found in the red blood cells. Once the blood gets through the chambers of the heart, its valves close, and the sound produced by valves is what we call ''heartbeat''. The heartbeat of a woman is faster than the heartbeat of a man. Another one of the fascinating facts about the circulatory system is that our hearts keep on beating even after they are removed from the body or torn to pieces. It takes around 23 seconds for the blood to circulate throughout the entire human body. A heart of an average adult is capable of pumping 4000 gallons of blood per day. The left side of the heart is thicker than the right one, and is also stronger. Our blood consists of red blood cells which are responsible for carrying oxygen, white blood cells responsible for battling diseases, platelets responsible for the clotting of blood, and a special kind of liquid called blood plasma. Up to 440 gallons of blood pass through the kidney on a daily basis. The lifespan of red blood cells is 4 months. The only cells that don't contain nucleus in human body are red blood cells. There are 30 to 40 millions of white blood cells inside human body that are responsible for protecting our bodies from foreign organisms. Ten capillaries are as thick as one human hair. The number of times our hearts beat per year is 30 million. Red blood cells circulate throughout the body around 250 thousand times before dying inside of their birthplace, the bone marrow. Out of all facts about the circulatory system, the most mind-blowing one is that its center, heart, has the power output that goes from 1 to 5 watts per minute, which equals to the power output of a 60-watt light bulb. 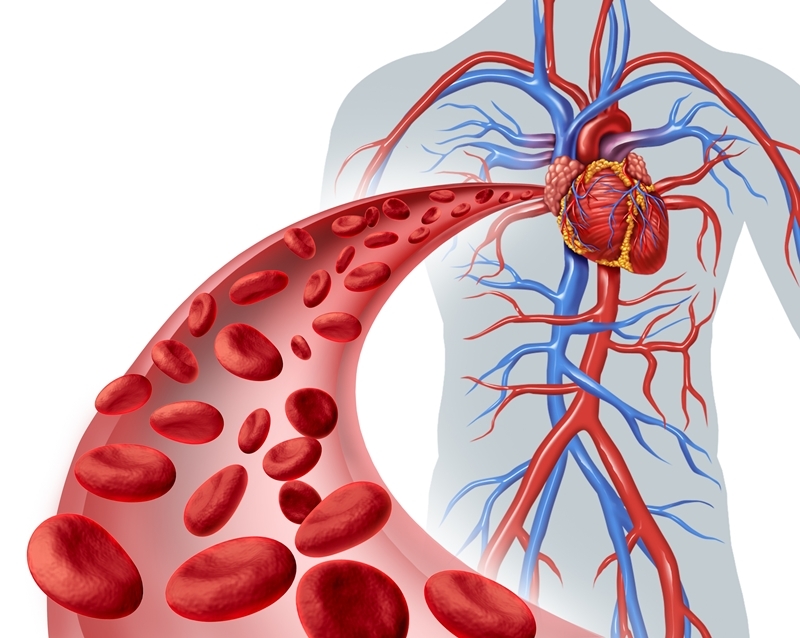 If put all of the arteries, veins, and capillaries of an adult's body end to end, the length will reach 62,500 miles. Thirty minutes of exercise a day will help your heart and the rest of the circulatory system stay healthy. Obesity increases the risk of developing high blood pressure, high cholesterol, and diabetes, all of which can further lead to heart attack and other cardiovascular diseases. If you are overweight, consider losing at least 10% of your current weight to decrease your chances of acquiring these conditions. One of the well-known facts about the circulatory system is that smoking can really do harm to it. Smoking can drastically increase your chances of developing various cardiovascular diseases such as atherosclerosis. When you finally quit smoking, the risk of developing these diseases diminishes noticeably as years pass by, no matter how long you have been smoking. The right foods include fruits, vegetables, dairy products, as well as whole grains. All of these are of high importance for the health of your circulatory system. At the same time, avoid alcohol and foods that contain trans fats and saturated fats. Stress can lead to the restriction of your circulation. In case you often feel stressed, you can try listening to some music you love, taking a walk, meditating, or doing anything else that makes you calm. When you are relaxed, the condition of your circulatory system will improve.